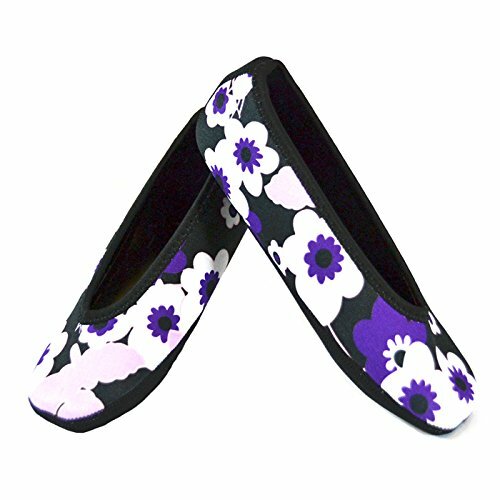 NuFoot Ballet Flats Women's Shoes, Best Foldable & Flexible Flats, Slipper Socks, Travel Slippers & Exercise Shoes, Dance Shoes, Yoga Socks, House Shoes, Indoor Slippers, Purple Flowers, X-Large by Nufoot at freespiritedfit.com. MPN: 1811. Hurry! Limited time offer. Offer valid only while supplies last. Prepare yourself for the ultimate in indoor comfort footwear. Nufoot Ballet Flats women’s shoes caress your feet while keeping them warm and dry.